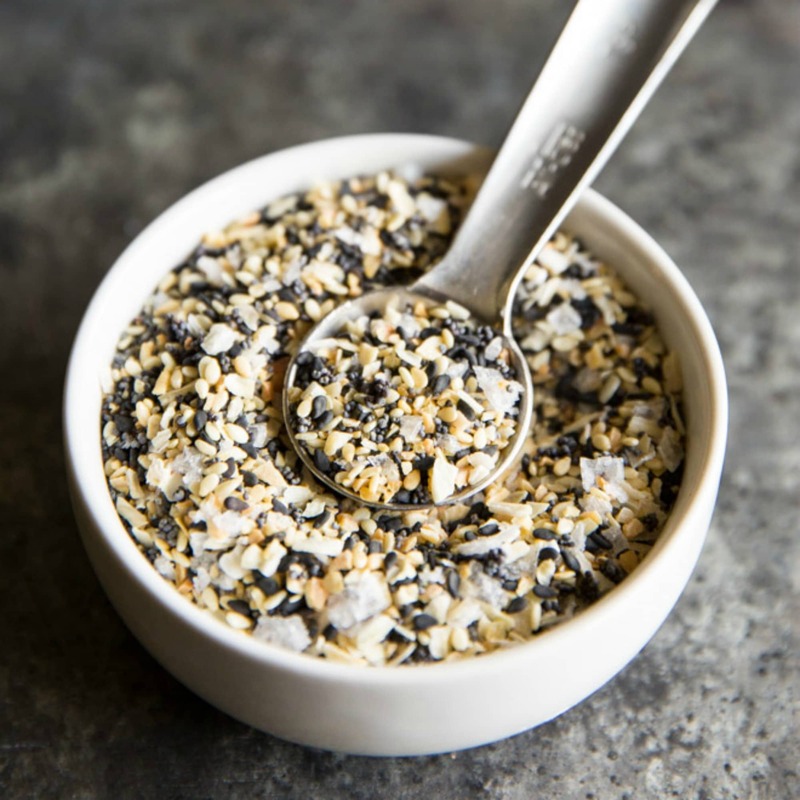 I love a rotisserie chicken as much as the next person, so I decided to create the perfect rotisserie chicken seasoning that skips all the preservatives and lets the chicken really shine. 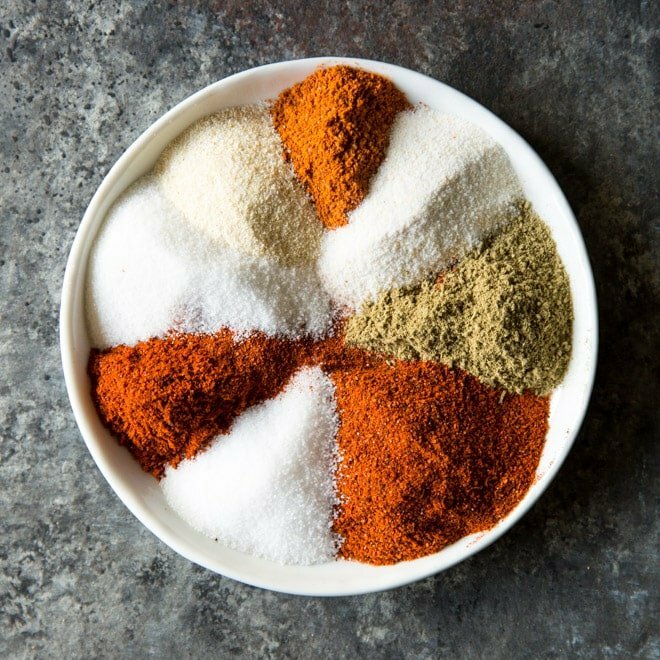 A little smoky and a whole lot of delicious—this seasoning blend works beautifully for all your chicken recipes, in the oven or on the grill. I’ll admit it: I’m always up to the challenge to figure out the best way to make a popular food even more delicious when it’s made at home, and I really think I nailed it with this seasoning blend for chicken. 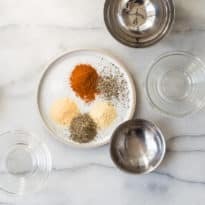 There are no fillers, flours, or sugars—just a pure spice blend that you can mix up and store in your pantry whenever the craving for rotisserie chicken strikes—which in my house is at least once a week. I can’t compete with the grocery stores; I read that Costco sells almost 60 million chickens a year! But I can get the satisfaction that I’m cooking my own food and controlling the ingredients I use…what could be healthier than that? Besides that, testing out this seasoning blend was so fun; the results are always delicious when you cook rotisserie chicken at home, and the house smells amazing, too. Making big jars of rotisserie chicken seasoning to give away as gifts? Click and slide the number next to “servings” on the recipe card below to adjust the ingredients to match how many you’re gifting—the recipe does the math for you, it’s that easy. What is Rotisserie Chicken Seasoning? It may seem like a top-secret recipe, but the simple truth is that it’s a blend of paprika, thyme, salt, pepper, garlic, and onion powder. 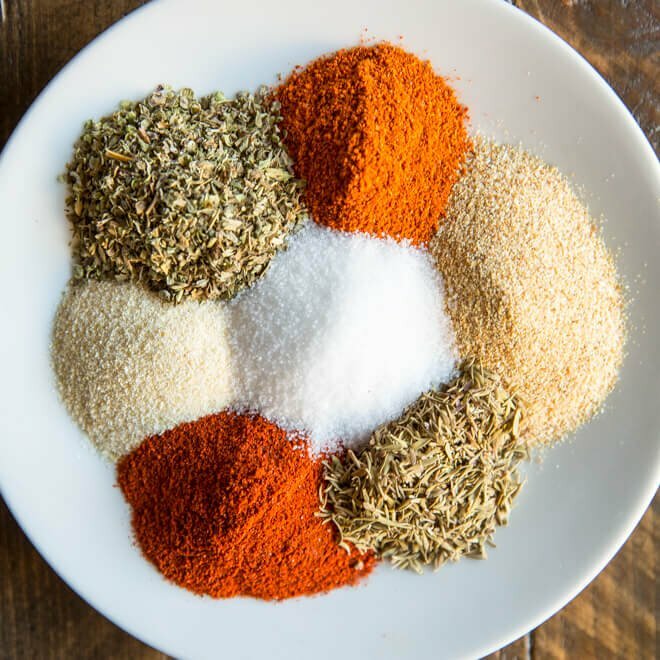 Of course, it’s not the only seasoning blend that will yield delicious chicken; it’s just the recipe that gives chicken that irresistible rotisserie chicken flavor. 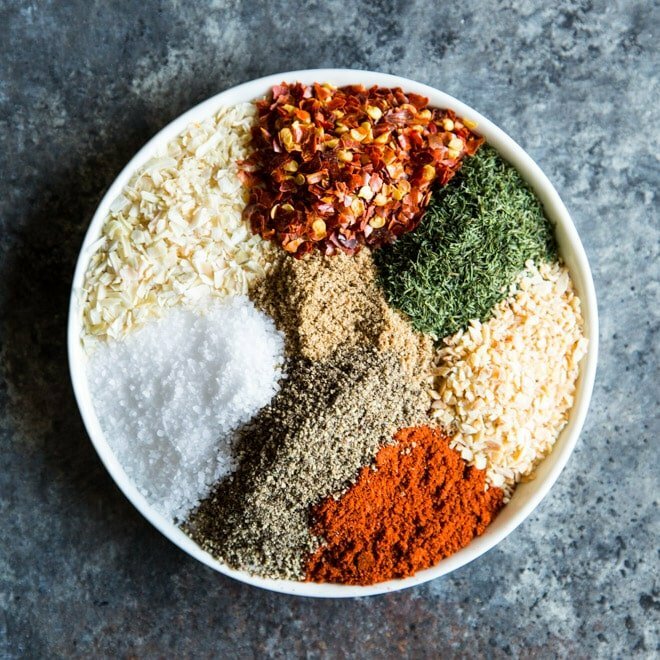 If you’re thinking about making rotisserie chicken in the oven, this is the seasoning recipe to use. My recipe for How to make Rotisserie Chicken starts with it. In a small bowl, mix together the paprika, garlic powder, onion powder, and dried thyme. Add salt and freshly ground black pepper to taste. Is Rotisserie Chicken Seasoning gluten free? 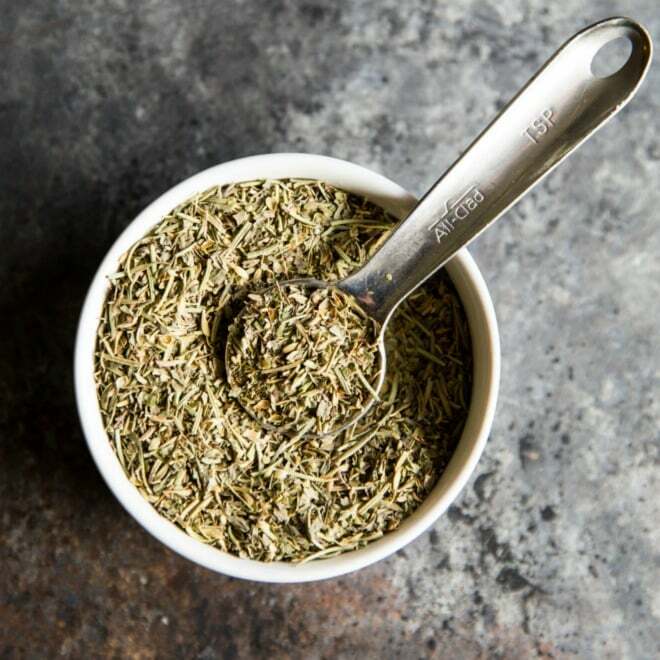 This homemade rotisserie seasoning blend is gluten-free, sugar free, and soy free, but I can’t guarantee other store bought versions are. Read those labels carefully, or just make this version. What are the ingredients of a grocery store rotisserie chicken? How do you use Rotisserie Chicken Seasoning? This recipe is good for one 4-pound to 5-pound chicken or about 5 pounds of assorted chicken pieces such as breasts, thighs, or quarters. Look for bone-in, skin-on chicken for best results. However, the seasoning blend is also great applied to boneless, skinless chicken if that’s more your style. I like to brush a little olive oil on the chicken before applying the rub; it helps it adhere to the chicken while it cooks. I often make two chickens at a time, because it doesn’t take that much work to make twice the amount of food. After rinsing the chicken and patting it dry with paper towels, place the chicken in a shallow roasting pan. Next, brush the skin with a little olive oil and generously dust the chicken with the seasoning. Then, cook the chicken at 425 degrees for 70-80 minutes, until the internal temperature of the chicken reaches 165 degrees. Making rotisserie chicken in the crockpot is easy and completely delicious, but the skin likely won’t be as crisp as it is when made in the oven. After rinsing the chicken and patting it dry with paper towels, brush the skin with a little olive oil and generously dust the chicken with the seasoning. Place the prepared chicken in the slow cooker and cook on HIGH for 3-4 hours, or LOW for 6-8 hours. What is paprika, and what can you use instead of paprika? Paprika is the fourth most consumed spice in the world, usually made from less pungent, shiny and dark red color variety of chilis. It often appears in spice rubs, marinades, stews, and chilis. Depending on the variety of pepper and how it is processed, the color can range from bright red to brown and the flavor from mild to spicy. Most of the paprika sold in grocery stores is simply labeled “paprika.” It may come from Hungary, California, or South America. Basic paprika tends to be neither sweet nor hot, and adds color to anything it is sprinkled on. I like this variety from Hungary, which is more sweet than spicy. 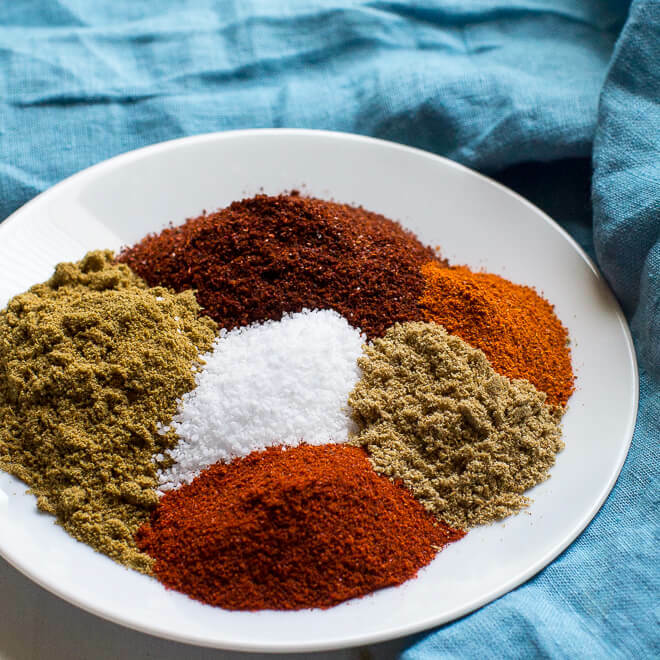 Smoked paprika is definitely more smoky and woodsy in flavor and would be a nice substitution for regular paprika in this seasoning blend. However, if you’re just having trouble finding paprika, try a mild chili powder in its place. Whisk all dried ingredients and spices together in a small bowl. Use immediately or store in an airtight jar in the pantry for future use. A little olive oil brushed on the chicken will help the seasoning stick to the chicken as it roasts. Hello, I was giving up on a new way to cook chicken. You changed my mine. This is the only way my family loves there chicken . I even sprinkled on cut up plain chicken ,chicken burgers. .loving it an everything is in the cabinet. Thanks. This is a 10 star.